How Many Buttons Does The New Guitar Hero Controller Need? More, if pics from the game's official site are anything to go on. And hey, I'm going to say "yes", yes they're something to go on. They show a couple of guitars leaning on an amp, guitars that have more than just the traditional five neck buttons. 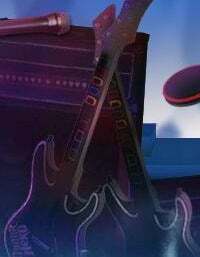 To my tired old eyes it looks like another five farther down the neck, which will no doubt increase the complexity of some solos, while also increasing the number of "oh, Rock Band did that already" comments at the same time.